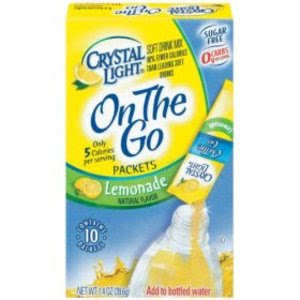 NYC Recession Diary: Crystal Light’s Water Way Challenge: Free Crystal Light! Crystal Light’s Water Way Challenge: Free Crystal Light! Would you like some Crystal Light with that? Today from 11 a.m. to 6 p.m. and tomorrow from 10 a.m. to 6 p.m. Crystal Light convertibles will hit major New York hot spots with samples (bottled water and Crystal Light on the go packets) and information about the Water Way Challenge. What is the Water Way Challenge? According to a recent survey, 74 percent of American women would like to drink more water every day. Since women who drink Crystal Light® typically drink 20 percent more water, the brand is launching the Water Way Challenge to encourage people to drink more water by converting to refreshing and flavorful Crystal Light. In addition to helping people make a change for themselves, Crystal Light is supporting Global Water Challenge, a coalition that helps provide access to safe drinking water. For more information on the national tour and to sign up for the Challenge, visit http://www.deliciouschange.com/. WHERE IT STARTS: The Grace Building (6th Ave. and 43rd Street) and favorite New York hot spots!